Each year, the AFL celebrates Women’s Round in acknowledgment of the extensive contribution made by women to football. This year, the theme for Women’s round is talent. A woman that personifies the theme of talent is Queensland’s own, Jo Butland. After a storied career, which has included state and national championships, all-Australian selection and international success, the 36-year old veteran has decided to call it curtains on her playing days. Butland’s final hurrah was at the 2013 National Women’s Championships held in Cairns last week. It was the first time the Championships had been held in the Sunshine State, providing a significant send-off for the veteran Queenslander. “It was special as I could have my parents watch the games as they have been great supporters of my sporting career,” said Butland. “This year’s competition really shows how far women’s AFL has come and hopefully it will inspire more females to have a go,” she said. Butland’s career serves as an inspiration to any young aspiring female AFL player or professional athlete. Butland was an established goalkeeper for the Matilda’s between 1997 and 2001 before transitioning to AFL on the advice of her sister-in-law. 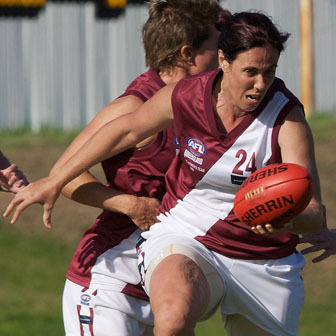 Playing for North Cairns in the AFL Cairns Women’s League, Butland was named league Best and Fairest four times in five years between 2003 and 2008. In 2006, she was selected to be a part of the first Australian women’s international rules football team to tour Ireland. Continued success followed, named all-Australian on four separate occasions, and capturing an unprecedented eight premierships. Butland has also contributed heavily off the field, and has been a catalyst towards the growth of women’s AFL in the Cairns region. In a week where the AFL aims to recognise, honour and pay tribute to the efforts of all women involved in football across Australia, there is no better example of excellence than Jo Butland. Her efforts on and off the field embody the spirit of game and demonstrate how perseverance and hard work can lead to a fruitful and rich career.